The idea of sharing is not a new one and can be transferred – both commercially and non-commercially – to many different areas: housing, tools, kitchen utensils and even food. Why should something spoil in the cupboard or supermarket shelf, if someone else could really use it? According to the University of Stuttgart, about 11 million tons of food are thrown away annually, only in Germany. The Federal Ministry of Food even assumes that it could be up to 20 million tons. This is 30 to 50 percent of all food produced! But most of this is not necessarily spoiled: sometimes even though one single tomato of a bunch is bruised, the whole package is disregarded. Sometimes, only the best before date has expired, so the goods are not be sold anymore. Sometimes you bought way too much food, or the fridge is still full, and you are flying out for holiday. So, what should you do with the food? Valentin Thurn, the director of the documentary “Taste the Waste” didn’t want to accept the waste of food in Germany any longer, and sought ways of how to tackle the huge piles of rubbish and the linked overproduction. 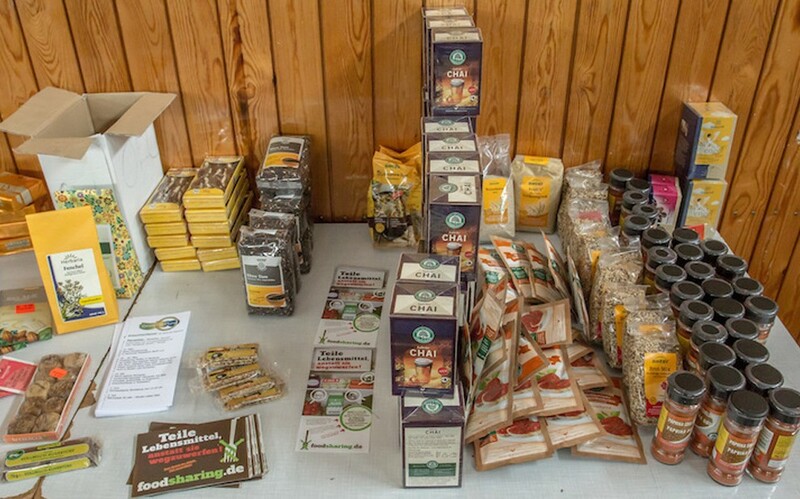 He founded – in cooperation with other volunteers – food sharing communities, which are spread by now throughout Germany. Thurn and his colleagues considered how they could save food best before it spoils, and devised two simple but effective ways. He founded the website foodsharing.de that works like a marketplace. Here, anyone who has food left, can offer it to be picked up. The second option is fixed „hotspots“, called Fairteiler. At the hotspots, publicly accessible refrigerators are placed, in which you put dispensed food as well as take it with you. The refrigerators are filled, if someone has something left, or if volunteers of the food sharing community help out. They drive through the city and collect everything from health food stores, supermarkets or snack stalls, what is still edible. Some fill the refrigerators by “dumpster diving”: At night they search the bins of supermarkets – a controversial and sometimes even illegal practice. Whoever needs food, can pick it up for free, either directly with the people, who have advertised this on the internet, or everybody can help themselves at one of the public refrigerators. So the food still lands on a plate instead of in the bin. For those who want to get involved, please register on foodsharing.de. After the data has been checked you can start and save the food of participating companies. Trust is the heart here: the names of the companies who give bread, yogurt, fruits and vegetables have (unfortunately) been kept secret. Although there is a disclaimer that all food savers have to accept that all companies donating food are legally rid of any responsibilities, even by negligence. However, so far there is no secured legal basis about giving away food. In Germany, the movement celebrated its second anniversary on December 2014. According to their own information they have saved and distributed during this period food worth than over 3 million euros. What experiences have you had when sharing your food with others?